Let’s try not to panic just yet. The debut season of the League of Legends European Championship, or LEC, kicked off on Friday and featured matches between big teams such as G2 Esports, Misfits Gaming, and SK Gaming. One of the more noteworthy teams, Fnatic, started off their season noticeably worse than any of the other big names, though. They went 0-2 against SK Gaming and Origen, placing them in last place with only one other team, Rogue. Every other organization won at least one game throughout the first week, making Fnatic’s double losses sting all the more. Needless to say, fans are a little perturbed. Fnatic isn’t just a big name, they won both splits in 2018, made a run through MSI, and, most famously of the bunch, they made it all the way to the finals at Worlds. There, they secured a runners-up finish after China’s Invictus took them down. So how could this extremely successful team look like one of the worst heading into the new season? Well, if you think about it, it’s not actually as big of a shocker as some fans are treating it. For starters, Fnatic lost a lot heading into 2019. Rasmus “Caps” Winther, who many regarded as one of the best mid laners in the world, left to join G2 for this year. Long-time teammate Paul “sOAZ” Boyer also left his post in the top lane to join Misfits, while coach Dylan Falco joined FC Schalke 04 as head coach. 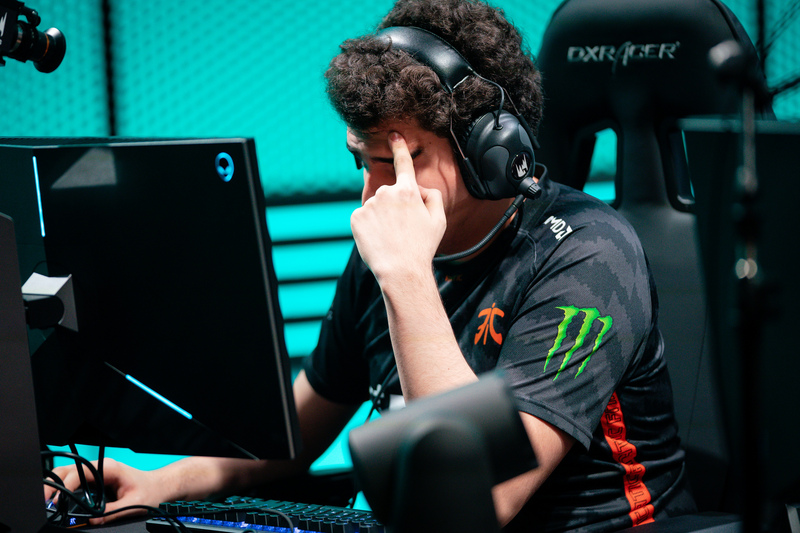 Without their star player and now lacking the ability to trade top laners on a per-game basis, it’s no wonder that Fnatic are struggling a little bit. It doesn’t mean they’re bad, it just means they have to find a completely new rhythm and strategy that works for this new squad. For proof, we can look to the bot lane. Martin “Rekkles” Larsson is one of the most well-known League players in the world, and he’s been with Fnatic almost every year since 2012. His tried-and-true choice of bot lane carry is some form of late-game hyper carry like Tristana, and almost every time the meta shifts to favor early game burst marksmen or non-marksmen, he suffers because he just keeps trying to play Tristana. Well, this year, in both games he’s played, he’s locked in Jhin and Lucian. To see Rekkles attempt to practice these types of champions more on-stage means that he’s open to experimenting at the start of the season. That being said, losses are never fun, but they’re not unexpected when a team loses part of their core style over the course of a couple months. Do we think Fnatic will win this split? It’s way too early to tell, just like it’s way too early to say that they’re down and out. What we can predict, though, is that they keep trying out more and more champions and strategies on the Rift.